My plane landed in Zurich at 11am. The airport was interesting: there really are men who look like the figures on beer steins, and there really are men who dress up in leiderhosen and look quite elegant. Refreshing, really. Although my destination was Montreux, I flew into Zurich so I could take the three-hour train trip and do some armchair exploration after the overnight flight. The country is gorgeous — verdant, lush, and rural, all of which surprised me almost as much as the fact that the weather throughout Switzerland was warmer than in Florida at the time. The integration of towns and agriculture was interesting, for even in the larger towns, little cattle pastures dotted hillsides between developments and streets. Many fields were freshly plowed. The Swiss take their agriculture seriously: in the United States and everywhere else I’ve ever been, our round bales are harvested and left to lie in the fields, at best covered by a tarp. But in Switzerland, each round bale is shrink-wrapped in a protective plastic case. 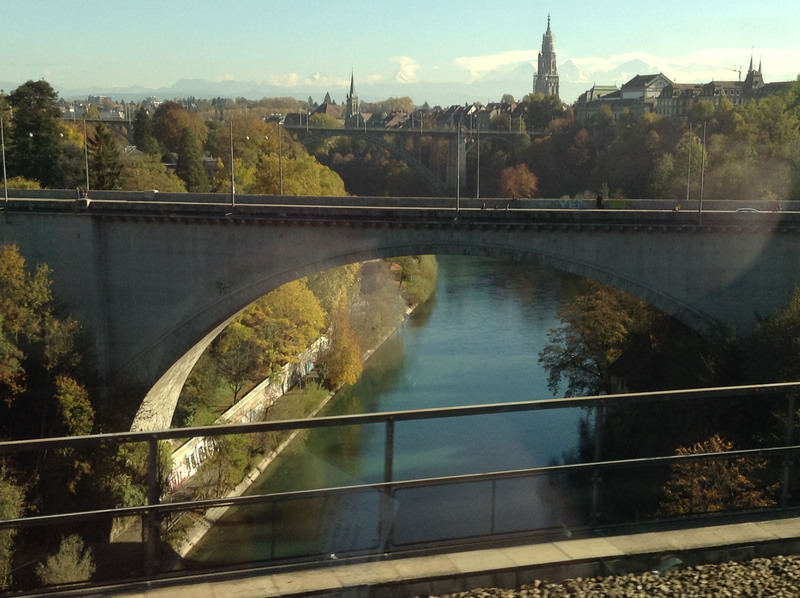 The train went through Bern, an exceptionally beautiful city from what I could see. The rolling hills and mountain backdrops were reminiscent of Virginia’s Shenandoah Valley off of I-81, as well as parts of West Virginia. After the pastoral trip of more than two hours, I was NOT prepared for the view as the train rounded a bend into the Lausanne region. It was as if a curtain rose: the beautiful Lake Geneva suddenly appeared, along with grapevines on every hillside. The spectacle was just amazing.